If you have several client installations on your network, all using the same data, complications may arise if more than one collects mail via POP3. Multiple simultaneous connections to one POP3 mailbox can cause lockouts, or duplicate messages being downloaded. •At regular intervals, eg every 20 minutes. 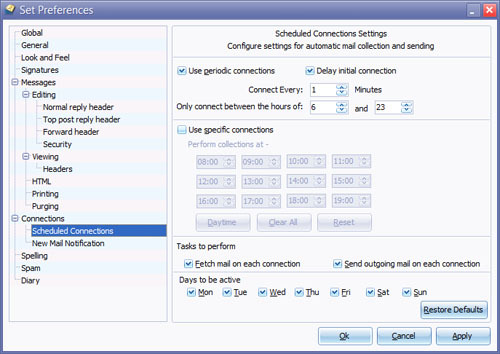 NOTE that the Fetching and/or sending of mail here will relate only to these scheduled connections - a separate configuration applies to manual connections.